This location has two Rain Gardens! Both are directly across from each other. The Central Elementary School rain gardens were installed to beautify the site and to intercept, treat, and infiltrate stormwater runoff from the surrounding sidewalks. The 2011 Environnmental Club participated in the Stormwater Management in Your School Yard educational program that was designed to provide students with an opportunity to apply their science, math, and communication skills to real-world environmental problems through the building of a rain garden on the Central Elementary School’s campus. The Stormwater Management in Your School Yard educational program focused on increasing the fourth and fidth grade students’ environmental awareness in hopes that they will teach others in their communities about the importance of stormwater management. The students completed the nine module program, which included the installation of two rain garden. These rain gardens are part of the Cooper River Watershed. The Cooper River watershed is characterized by extensive residential and commercial development and as a result its streams are severely impacted by increased stormwater runoff. To address the water quality issues associated with increased stormwater runoff, demonstration projects like these rain gardens are essential. These rain gardens manage stormwater runoff coming from surrounding sidewalks. The rain gardens were installed by the Rutgers Cooperative Extension Water Resources Program staff, Rutgers Cooperative Extension of Camden County, Rutgers Master Gardeners of Camden County, Camden County Soil Conservation District, and the Central Elementary School's 2011 Environnmental Club. A sod cutter was used to remove the top four inches of material, then shovles were used to excavate an additional three inches of soil. Staff from the Department of Buildings and Grounds at the Haddonfield Board of Education assisted with the labor of the rain gardens by hauling away a portion of the native soil. River rock was laid around the storm drains in the middle of the rain gardens to prevent mulch from entering them. The storm drains will act as overflows during rain events greater than one inch. The native plants that were installed in these rain garden were purchased from Popes' Gardens. Approval to install the rain gardens was granted by the Central Elementary School's Principal. These rain gardens were funded by a 319(h) grant from the New Jersey Department of Environmental Protection. 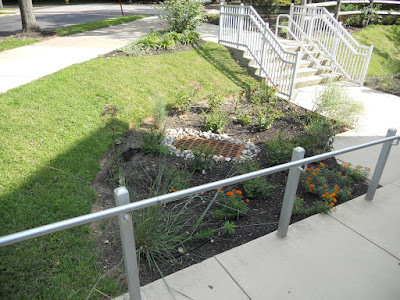 These rain gardens are maintained by theDepartment of Buildings and Grounds at the Haddonfield Board of Education, and the students of Central Elementary School.